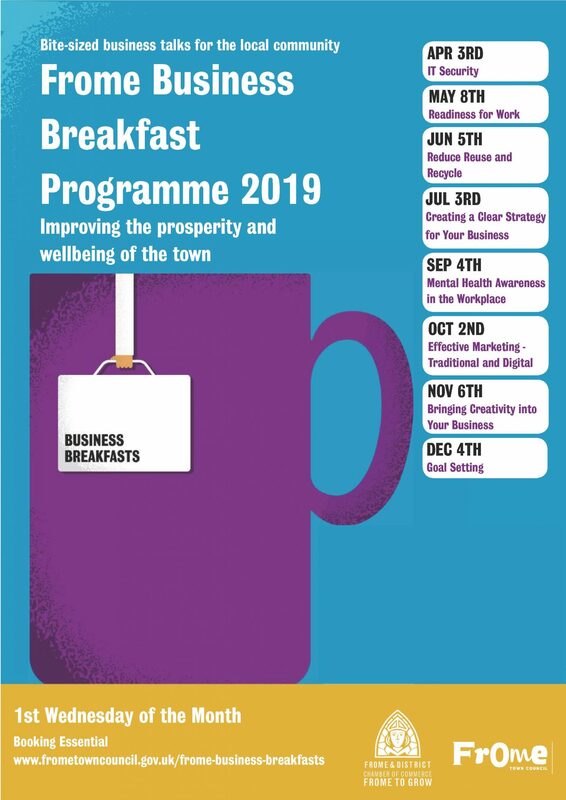 The Frome Business Breakfast is a monthly event that presents bite sized business talks for the local community. Each month, the sessions feature a local speaker with expertise in the chosen topic. Participants are invited to ask their own questions, join the discussion, or simply sit back and absorb the information. Take a look at the programme for 2019 below and here. Looking at how apprenticeships, trainees or placements increase your business’ productivity; whilst also growing a motivated, skilled and qualified workforce. Dave West, Somerset Skills & Learning, will talk through the benefits apprenticeships can bring to businesses. This will be followed by a discussion on how businesses can work with colleges and schools in Frome to help prepare students for employment. The event is being held at Somerset Skills & Learning Centre in Saxonvale, and will begin with a delicious cooked breakfast and there will be opportunities to meet and discuss the issues raised with other delegates. What you need to know to keep your business safe on the web. IT Security expert Rik Kershaw-Moore of Tsiolkovsky Solutions Ltd will explain why your business is at risk from Internet scams and security threats and explain what practical, inexpensive, steps you can take to protect yourself and your business. The event will be held at the new Stony Street House restaurant and includes a delicious breakfast. Small businesses thrive on creativity and innovation, however, these skills don’t come naturally to everyone. This event will demonstrate how to generate and develop ideas to contribute to a culture of originality. Chris Hardy, an experienced coach and group facilitator, will lead the workshop and help you develop a clear plan of how you will boost innovation within your company and what your next actionable step is. Organisations attending the next Business Breakfast will have the opportunity to learn about the benefits of market research in boosting business. Being aware of a customers’ needs and preferences is integral for any industry and this event will help those attending to gain practical information on how to get started. The breakfast will be at the Archangel on 2 October at 7am where attendees will hear from Cognisant Research on how to identify new business opportunities and changing trends. How Can Businesses Give Back to the Town? Many local businesses support charities, and more are turning their attention to what they can do for the community. What’s the best way for a business to help, whilst fulfilling its own needs? Apprenticeships, work experience placements and training courses provide valuable opportunities for businesses to grow a skilled team in an affordable and sustainable way, as well as combating inequality and disadvantage. The Frome Business Breakfast is an exchange of knowledge and experience, open to all and a great opportunity to meet with other local organisations. Organised by Frome Town Council, Frome and District Chamber of Commerce, and Business Manager Mairi Connelly. Here’s a look at what Frome Business Breakfast is all about. On the 3rd of July, Frome Council invited people from local schools and businesses to help promote apprenticeships among young people and to discuss how local business can support schools within Frome with offering apprenticeships and how the different schools are engaging young people with work skills, employability and how to apply for apprenticeships as well as to help and cater to students with different or special needs and difficulties.